This easy recipe for smoked salmon potato salad is full of colorful healthy veggies, along with the lovely briny taste of salmon. This is a perfect summertime lunch or supper that is truly good and good for you! This bowl of smoked salmon potato salad is not only a rainbow full of delicious tastes and textures, it also is an explosion of healthiness, and honestly, what more could you ask for in a salad? 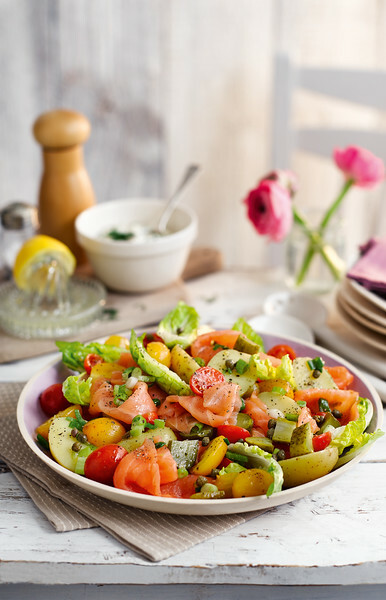 Cheery cherry tomatoes, tender potatoes, crunchy lettuce and the silky, salty taste of smoked salmon, with some capers and chopped pickle for sass, and just a hint of creamy dressing. And except for boiling up the potatoes, exactly NO cooking, which is music to my ears during these sultry summer evenings. Ready to dish up some of this healthy deliciousness in YOUR kitchen? Let’s make it! This lovely recipe comes to you courtesy of my friends at Slimming World, which in case you haven’t heard of them are an outfit that started out in the UK and is now here in the States. Those of you who have been reading my posts for a while know that I am always up for a new and interesting approach to healthy eating, from my adventures with the Whole 30 to fun with power souping, and I have to say that I am REALLY taken with how Slimming World approaches things. They take the same approach to cooking and eating that I generally try to follow, which is is to concentrate on proteins and veggies most of the time, while still indulging in the occasional treat (hello bacon and chocolate!) because life is too short not to have bacon and chocolate. Their website is chock full of gorgeous, healthy recipes – everything from chili to frozen chocolate caramel bites – and if you are looking around for a healthy eating plan that helps your to eat healthy without totally depriving you of things like frozen chocolate caramel bites, I encourage you to check it out…click here to get to their website for all the details! 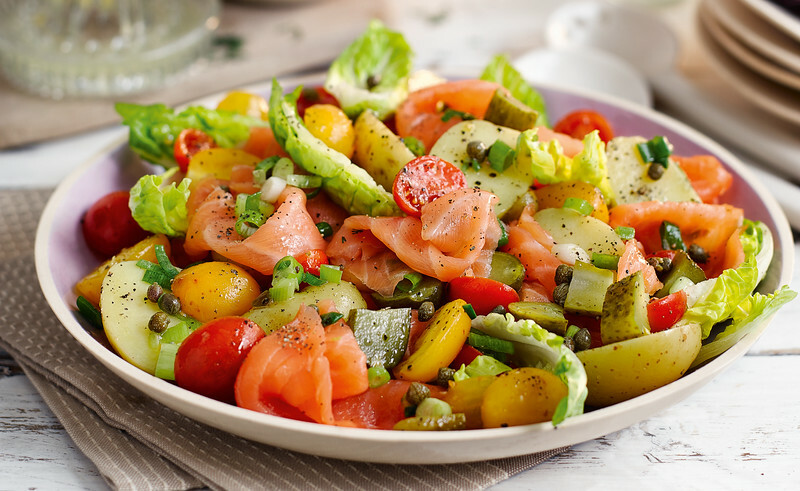 Meanwhile back at this salad, you need some baby Yukon potatoes, some cherry tomatoes, lettuce and a few other things, along with some smoked salmon. You can find smoked salmon either at the seafood counter of your favorite supermarket and/or in the refrigerated aisle. You’ll need to boil up the little potatoes until they are tender, and while you are doing that you can toss together the other salad components, along with the super simple creamy dressing. The folks at Slimming World recommend serving the dressing on the side…when I made this I couldn’t resist spooning a couple of tablespoons of it into the salad and giving it another gentle toss, and then serving the rest of it on the side. So if you are looking for the perfect healthy summer lunch or supper, give this delectable salad a whirl. And if you are looking around for a new healthy eating plan, definitely stop by Slimming World and check out what they have to offer. And remember…that can include frozen chocolate caramel bites. Happy sigh. Put the potatoes in a large saucepan and add water to just cover. Add a pinch of salt,cover and bring to a boil over high heat. Reduce the heat to medium and cook, partially covered, for 10 to 12 minutes, or until tender. Drain in a colander and cool briefly under cold running water. Drain again and transfer to a serving bowl. Add the smoked salmon, lettuce, cherry tomatoes, scallions, cornichons or pickles and capers to the potatoes and toss gently, until the ingredients are mixed. Grind over plenty of black pepper. To make the dressing, in a small serving bowl, whisk together the yogurt,mayonnaise, lemon juice, dill, mustard and salt and pepper to taste. Looks fantastic…and i can’t resistl adding an avacado! Maybe an avacado whole 30 dressing? Hmmm. Thanks!